Order an appetizer with a side salad when eating in a restaurant. 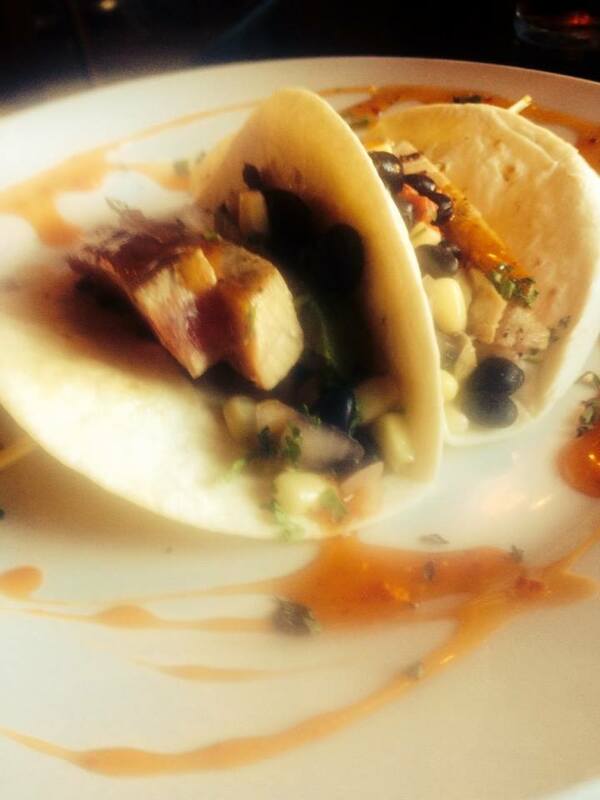 This was a wonderful tuna taco with corn-black bean salsa and a honey chipotle drizzle. If you order a full-size entree, eat only half and save the rest for the next day’s lunch. Tomorrow morning, to paraphrase Anne Lamott’s birthday column opener, I’m going to wake up 70 years old (9 years older than she). I am delighted that 1) I will most likely wake up; and 2) I will be at least 30 pounds lighter than on my 69th birthday. I’ve worked really hard on this; in fact, for most of the spring it’s been my job — planning every mouthful, recording same, hitting the Y four to six times weekly, working with a personal trainer, drinking water until my kidneys need life rafts. 1) Recording those mouthfuls and those 10 to 12 glasses of water daily. I aim for just under 1,700 calories and do not give myself any allowance for calories burned in exercise, even when I do a BodyPump class and come home to weed for 3 hours. Our family doctor says exercise is the only way he knows to raise “good” cholesterol. Plus, I feel better and sleep better. 2) Seeking applause. Maybe I could have shed this avoirdupois without my online fitness support group, but it’s been so much easier with the unstinting encouragement of the group. They’re kind cheerleaders. Also, I know that if I fall off the fitness wagon, I must report it. 3) Shedding toxic people. Show me some joy or I’ll show you the door. At least show me you’re capable of joy. Some people. Just. Aren’t. 4) Avoiding sugar like the plague it is. A recent study has linked inflammation and depression. All my life I’ve overdone the sugar, which, as we know, is a, if not the, primary cause of inflammation. And since high school — maybe even during — I’ve struggled with depression. These days, not so much because I haven’t binged on sugar in almost seven months. In fact, I haven’t binged at all in almost seven months. 5) Eating all the fresh produce we can pull from the garden, grab at the farmer’s market and/or squash (get it? get it?) onto our plates. I’m learning to eat cucumbers, and I already like jicama. I carry my lunchbox, stocked with healthy eats and water, any time I drive more than 10 minutes. 6) Drinking a 5-ounce glass of red wine every night, water and black coffee. The occasional diet soda (no more than 2 to 3 weekly and I’m trying to not drink those). No fruit juice, no milk. I can make a mean breakfast smoothie, but I love to chew. Evidently, a clear link also exists between anger issues and craving crunchy stuff. I’ve gnawed through a ton o’ baby carrots since Christmas. 7) Sleeping. Sleep’s as important as exercise to feeling and staying healthy. The television is not our friend. 8) Cheering on others. It helps as much as being cheered. And being with others. I’ve been way too isolated in the 26 years of this marriage. Now I’m learning to reach out to a friend and ask if she too wants to take in a “Magic Mike” matinée. 9) Ramping up my workouts every 3 weeks, whether it’s intensity, repetition or duration. 10) Trying something new, whether it’s the new BodyPump choreography, a new YMCA (my “metro” membership opens the doors at 17 in the area) or a new way to use mangoes. Going new places. Meeting new people. 11) Visualizing myself in a pencil skirt that is actually shaped like a pencil and not a Bosc pear. Visualizing good foods darting about my body to fix this and that. Visualizing high-calorie restaurant foods draping melted cheese over all my internal organs. 14) Hiding things I don’t want to eat. With my feeble memory, once it’s in a closet it’s forgotten. 15) No more than 3 weekly ounces of red meat, if that. After reading that most cardiologists and oncologists eat little if any, it was bye-bye beef and howdy, black bean burgers. 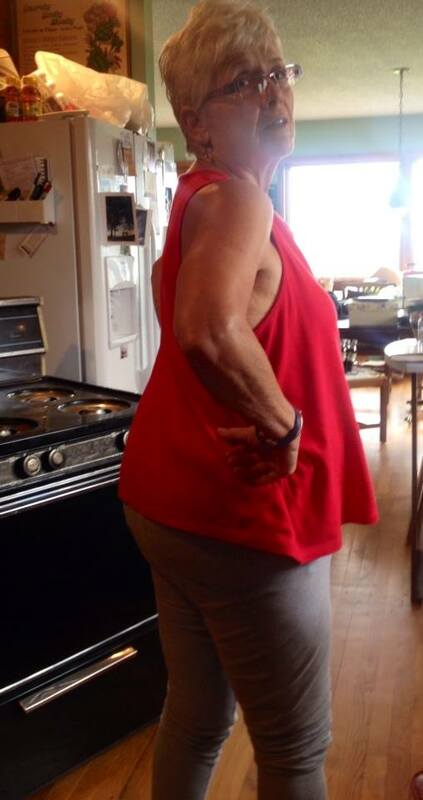 Eat your heart out, Kim K. Dressed for the Y with 30 pounds gone; 29 to go. Way to go! Congratulations on your achievement, and thanks for the good suggestions.